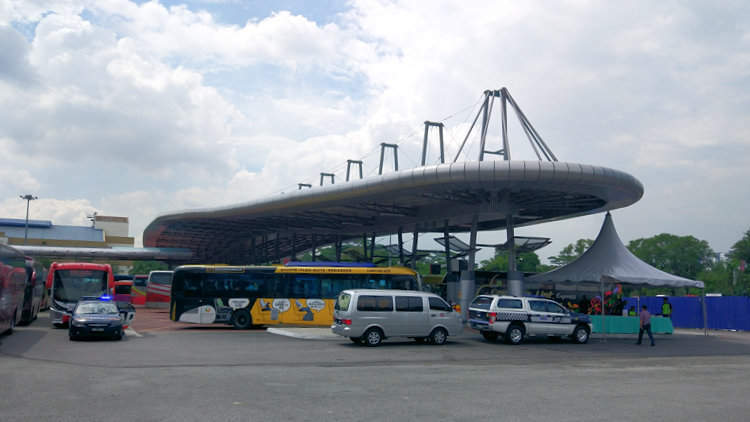 There are several places in Singapore where you can take a public bus to Larkin Terminal (aka Larkin Sentral) in Johor Bahru. Here, we'll show you the route that takes you across the Johor–Singapore Causeway. There are 3 buses that you can take from Queen Street to JB Larkin: SBS Transit 170, Causeway Link CW2 and Singapore-Johore Express(SJE). Bus ticket has to be purchased at the time of boarding and there is no online booking available. The cheapest way to Malaysia is to take the public bus SBS 170, which plies between Bugis and JB Larkin Terminal. It travels along Bukit Timah, Dairy Farm and parts of Woodlands. The bus also stops near these three MRT stations: Newton (NS21), Little India (NE7) and Kranji (NS7). The fare from Queen Street to Larkin is SGD2.50 when paid in cash, and SGD1.96 if you paid by the stored value fare card e.g. EZ-Link card. The SBS 170 service begins at 5.20am and the last bus at 12 midnight. Service frequency is between 11 and 17 minutes. However, there are over 60 stops along 34km journey from Singapore to Johor Bahru and takes about 1 hour and 45 minutes. N.B. At the immigration and customs checkpoints, you will have to get off the bus and clear immigration at both Singapore and Malaysia sides. After immigration and customs procedure, you will need to join the queue at the bus stop for the next available bus which may not be the same bus you took earlier. You will be required to show your bus ticket in order to board the bus again. The same applies for CW2 and SJE. Causeway Link CW2 also plies between Queen Street and Larkin Terminal. However, it is a non-stop service, so passengers have to get on at Queen Street and do not have the flexibility of boarding at bus stops closer to home. The first bus departs Singapore at 0600. Services end just before midnight and prices are based on point of departure. Travelling from Queen Street to Larkin costs SGD3.30 and the return trip from Larkin costs MYR3.40. Yet another Queen Street–Larkin non-stop service. The Singapore-Johor Express leaves Queen Street Terminal at 7-20 minutes interval between 6.30am and 11.30pm daily. The bus ticket costs SGD3.30 from Queen Street to Larkin and MYR3.40 from Larkin to Queen Street. If you are staying near the nothern part of Singapore, e.g. Ang Mo Kio, Yishun or Choa Chu Kang, you may want to take the CW1 from the Kranji MRT Station. Causeway Link CW1 has a shorter route between Kranji MRT Station and Larkin Bus Terminal, and costs only SGD1.50. The first bus departs Kranji MRT Statiion at 4.30am and last bus at 11.30pm. The waiting time between buses is about 20 to 30 minutes. If you're not in a hurry, taking an express bus via Larkin will cost a lot less than from Singapore and save 50% or more. You could travel from Larkin Terminal to virtually anywhere in Peninsular Malaysia. Centrally located, it's the gateway to get to other part of Johor and the rest of Malaysia. 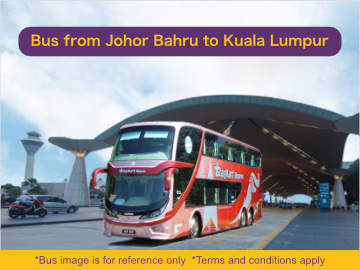 From JB Larkin Terminal, you can hop on a bus to just about anywhere in Malaysia, including nearby towns in Johor such as Batu Pahat, Kluang, Segamat, Mersing, and far away northern towns in Perak, Penang, Kedah and Kelantan. 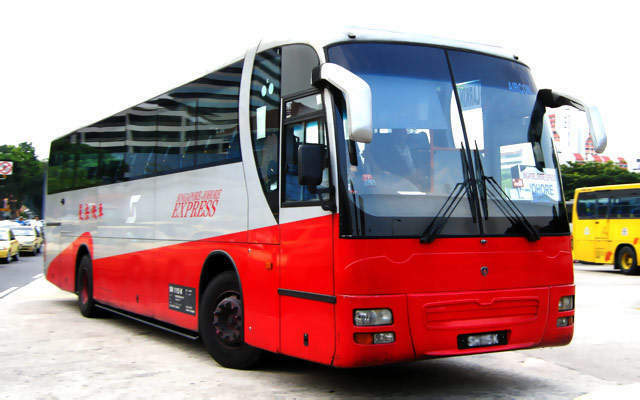 For example, bus ticket from Larkin to Kuala Lumpur starts from MYR30, that's less than SGD10 and half the price for express bus from Singapore to Kuala Lumpur. Another popular route is to travel from Larkin to KLIA, the one-way bus fare costs MYR45 and the trip takes about 5 hours. Check out the table below for bus ticket prices to other parts of Malaysia. Travelling from Larkin to other destinations in Malaysia? 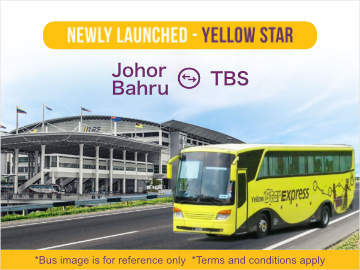 Online bus ticketing is available for buses departing from JB Larkin Terminal. Find the best timing and compare prices at Easybook.com.